The Curve Color node takes as input Curves and adds a fill color and a stroke color to them. output Img Image with a grow filter of 5 x 5 pixels. Drag the Curve Color icon into the Node Graph. Connect a curve value to the curve input. image An image with the colored curve. Color Defines the background color and opacity. 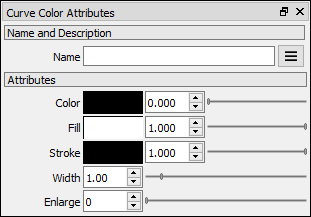 Fill Defines the fill color and opacity. Stroke Defines the stroke color and opacity. Width Defines the width of the stroke. Enlarge Enlarges the image around the bounding box of the curves.